Having lost her Future Title shot, Gracia dropped back down to opener duty. Weirdly, despite being a teenager, Ruaka is the veteran of these two. She had her first match in 2016 while Alex’s debut was a year ago this month (at least according to the YouTube video I’ve found of it). Not that it made a huge difference either way as both of them are green as parsley. That led to a clunky match-up which must have gone less than five minutes before Gracia hit her Top Rope Thesz Press for the win. There’s really not much more to say, it was what it was. Both Ruaka and Gracia will have better performances with more experienced talent. Natsu is a fan of Iida’s chin and promised to pay special attention to it in her pre-match promo. Meanwhile, Konami referred to Sumire as ‘big face Natsu Sumire’ in some school ground level taunting. Sumire then spent the match trying to get in the good books of her opponents. She teamed up with both of them at various times, before switching sides when the tide began to turn. It might not have been a particularly moral wrestling style, but it was ingenious. It would work too, as even when Iida and Konami cottoned onto her games, she was still able to sneak out with the win (much to Konami’s annoyance). It left us with a match where your enjoyment will directly relate to your enjoyment of Natsu Sumire. As I said in a previous review, I’ve fallen for her charms, so I had fun. If you haven’t, maybe give it a skip. Natsu really digs Kashima’s music (it is a banger). She was still at ringside as she made her entrance and was having a lovely old time. Sadly, Kagetsu didn’t join the fun. The champ was in a proper shithousing mood during this one, as she made it obvious she had no time for the twins and was wandering around the ring spraying water in everyone’s eyes. Although Rina probably preferred that to Hazuki kicking in her the face. This was what we’ve come to expect from matches featuring the rookies. They showed a lot of fire, occasionally bursting forward with their tandem offence, but ultimately, didn’t have enough to compete with their more illustrious opponents. Kashima, of course, threw a slight spanner in the works, as she proved to be capable of fighting off Oedo Tai almost single-handedly, but could only keep that up for so long. It ended up being a pretty routine victory for Oedo Tai, but it was fun while it lasted. Hana and Bobbi apparently watched Oedo Tai’s antics and decided to one-up them. They were in very disreputable moods, as they started throwing JAN into chairs and doing all sorts of mean things. That’s not a very nice way to behave. It set up a heated showdown between these teams as Hana, in particular, has made her way into JAN’s bad books. Both of them seemed desperate to get their hands on her, but she kept slipping away from their grasp, staying one step ahead for the bulk of the match. In fact, that was very much the story they were telling. Both Kyona and Tora excel with powerhouse bursts of offence. Big moves that put people down and keep them down. Yet, to do that, you need to get your hands on your opponents. Kimura and Bobbi always felt like they knew what was coming. Jungle Kyona pointed out pre-match that she hadn’t won a match this year, and it looked like that streak was going to continue. Except there’s one thing you can’t teach, and that’s some good old-fashioned experience. Bobbi Tyler should have seen this one away, she had her shot, but she took too long. That split second gave Jungle a chance and she only needed one. Once she was on the front foot she wouldn’t let it go, and a vicious Spinning Sitout Powerbomb took the three. This was great. A fast-paced, hard hitting match that was worked like it meant something. 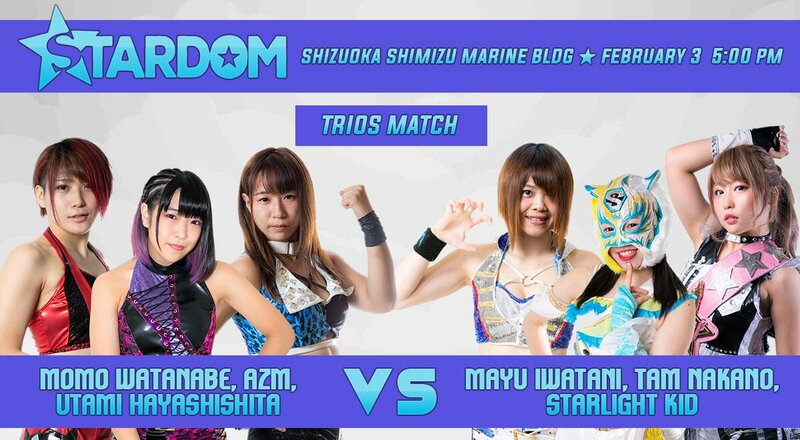 This was a mash-up of various feuds as AZM and Kid had fantastically entertaining face-offs all tour, Nakano is just coming off a title match against Watanabe and Iwatani is heading into one. Meanwhile, Utami’s in the background with the 500 belts she’s managed to collect in recent months. Those interweaving stories came together in a match that whizzed by. There was a lovely contrast between the seamless High Speed style of AZM vs Kid and the beating the pulp out of each other that everyone else was going for. Both Nakano and Iwatani were giving it everything when they were in the ring with Watanabe, and those combinations both pop off the screen. In the end, Kid threw herself from the top to the floor to wipe out the QQ team before tossing AZM into the ring where she took Iwatani and Nakano’s Lung Blower/German combo. Mayu would then follow up one cool move with another as she transitioned seamlessly into her elevated Dragon Sleeper for the submission win. This won’t go down as a match of the year contender or even something you’ll remember much past viewing it. However, it was a perfect build-up for the weeks ahead. Iwatani looked strong and picked up a dominant victory while every interaction was a delight. In that sense, it did exactly what it needed to. An enjoyable Road To style show that was building to the next couple of shows for Stardom. There is nothing you need to go out of your way to see, but if you catch the last two matches, you’ll have a nice time.